Discussion: Mike Stackpole picks several huge bones about Michael Palmer's The First Patient. Huge bones about plotting, pacing, and more... spoilers are included, but in spite of the major problems Mike S has with this book, he recommends it as an example for writers to break down and see what not to do when crafting a story. If you want to discuss something you think is a bad book, send us a breakdown. Remember, it has to be a technical discussion about what didn't work, and not just an opinion that you didn't like the story or the author. 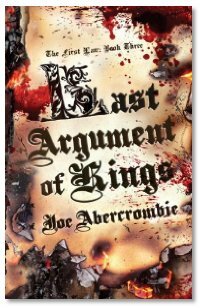 Interview: This week, Mike, Summer and Mike talk with Joe Abercrombie about Last Argument of Kings, the third book in The First Law Trilogy. We talk about the characters and the more contemporary feel of their speech, the more intimate nature of relationships and intrigues, and about how the buzz about these stories surround the writing style of the battle scenes. Take a world with a Tolkienesque feel, take some characters with deeper shades of grey and black, throw in some more twists upon the expectations from common tropes, and a world with a darker noir feel, and you've got an idea about what you're in for when you read the books in The First Law Trilogy. Coming up in June 2009, Joe has a new book coming out, Best Served Cold. Excellent show. Makes me wonder if the book managed to fall through a crack in the system or was punted through? at least it wasn't a battle tech book!